One factor behind this recent wave can be traced to the Refugee Act of 1980, which made it easier for those fleeing conflict-ridden areas, such as Somalia and Ethiopia, to resettle in the U.S. Back then, less than 1% of all refugee arrivals were from Africa, compared with 32% today, according to figures from the U.S. State Department’s Refugee Processing Center. Statistics from the Yearbook of Immigration Statistics confirm this point. Among refugee arrivals in 2013, five of the top 10 countries of nationality were in Africa: Somalia, the Democratic Republic of Congo, Sudan, Eritrea and Ethiopia. Foreign-born Africans come from all over the continent, but the most common countries of origin for African immigrants are Nigeria, Ethiopia, Egypt, Ghana and Kenya. 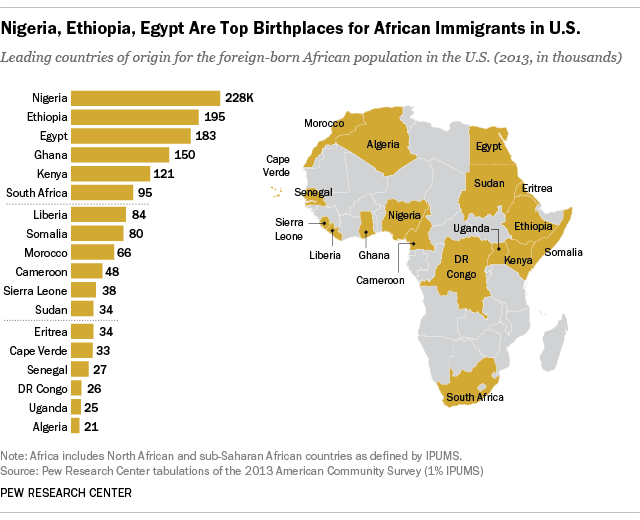 These five countries accounted for nearly half of the foreign-born African population in the U.S in 2o13. In other states, Africans represent a higher percentage of the foreign-born population than the national average. Many African refugees from Sudan, Somalia and Ethiopia have settled in South Dakota (Ethiopians are the largest immigrant group overall there). Africans make up 28% of South Dakota’s foreign-born population. Fueled by Minnesota’s sizable Somali-born community, 21% of the foreign-born population in that state is African. Africans account for a sizable portion of the overall immigrant population in several other areas, including Washington, D.C., Maryland and Maine.